Easy to use, soft cover pamphlet with all the Vermont Rules of Evidence and handy index. 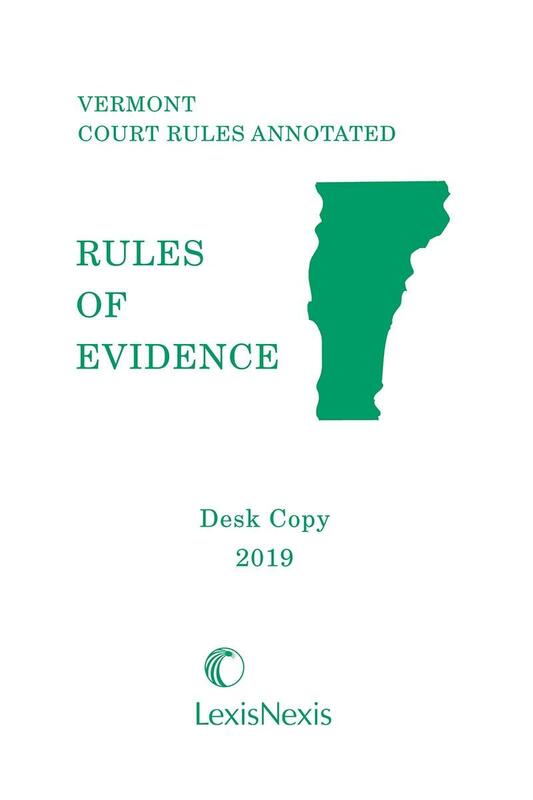 This newest edition of Vermont Rules of Evidence Desk Copy is a lightweight, economical and durable softbound volume you can easily carry to court or keep on your desktop. It contains the Vermont Rules of Evidence, cross references to rules of a related nature, annotated Vermont Supreme Court decisions construing the rules, notes describing changes to the rules affected by orders of the Vermont Supreme Court, a conveniently organized table of relevant statutes, and a comprehensive index for quick reference, so you can find what you need when you need it fast. 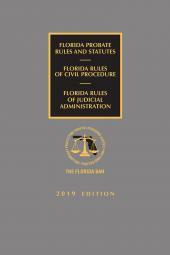 We publish an updated edition annually, and the low price point means you can purchase a new copy every year to ensure you are going to court prepared. Let your clients--and the opposing counsel-- see how much you care about their case when you walk into the courtroom with the most recent edition of the Vermont Rules of Evidence Desk Copy from LexisNexis, the official publisher of Vermont Statutes Annotated and the official provider of online primary source content for the Vermont judiciary. 106. Remainder of or Related Writings or Recorded Statements. 201. Judicial Notice of Adjudicative Facts. 301. Presumptions in Civil Cases. 303. Presumptions in Criminal Cases. 401. Definition of Relevant Evidence. 402. Relevant Evidence Generally Admissible; Irrelevant Evidence Inadmissible. 403. Exclusion of Relevant Evidence on Grounds of Prejudice, Confusion, or Waste of Time. 404. Character Evidence Not Admissible To Prove Conduct; Exceptions; Other Crimes, Wrongs or Acts. 405. Methods of Proving Character. 408. Compromise and Offers To Compromise. 409. Payment of Medical and Similar Expenses. 410. 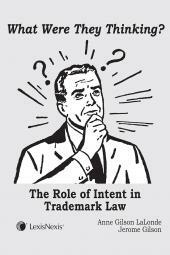 Inadmissibility of Pleas, Plea Discussions, and Related Statements. 412. Inadmissibility of Statements Made by Ward To Guardian Ad Litem. 501. Privileges Recognized Only as Provided; Statutory Privileges. 510. Waiver of Privilege and Work-Product by Disclosure. 511. Privileged Matter Disclosed Under Compulsion or Without Opportunity to Claim Privilege. 512. Comment Upon or Inference From Claim of Privilege: Instruction. 601. Competency in General: Disqualification. 602. Lack of Personal Knowledge. 605. Competency of Judge as Witness. 606. Competency of Juror as Witness. 608. Evidence of Character and Conduct of Witness. 609. Impeachment by Evidence of Conviction of Crime. 610. Religious Beliefs or Opinions. 611. Mode and Order of Interrogation and Presentation. 612. Writing or Object Used to Refresh Memory. 613. Prior Statements of Witness. 614. Calling and Interrogation of Witnesses by Court. 701. Opinion Testimony by Lay Witness. 703. Factual Bases of Opinion Testimony by Experts. 704. Opinion on Ultimate Issue. 705. Disclosure of Facts or Data Underlying Expert Opinion. 803. Hearsay Exceptions: Availability of Declarant Immaterial. 804. Hearsay Exceptions: Declarant Unavailable. 804a. Hearsay Exception; Putative Victim Age 12 or Under; Person with a Mental Illness or Developmental Disability. 806. Attacking and Supporting Credibility of Declarant. 807. Testimony Where Victim Is a Minor Or a Person with a Psychiatric, Intellectual, or Developmental Disability. 901. Requirement of Authentication or Identification. 903. Subscribing Witness' Testimony Unnecessary. 1004. Admissibility of Other Evidence of Contents. 1007. Testimony or Written Admission of Party. 1008. Functions of Court and Jury. These rules govern proceedings in the courts of this State to the extent and with the exceptions stated in Rule 1101. This rule is identical to Uniform Rule 101 and is similar in language and effect to Federal Rule 101. This rule states the applicability of the Rules of Evidence in general terms. 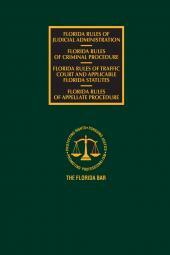 Rule 1101 specifies in detail the courts, proceedings, questions, and stages of proceedings to which the rules apply. The Vermont Rules of Evidence are promulgated by the Supreme Court under the authority of the Vermont Constitution, Ch. II, § 37, which provides that the Court ''shall make and promulgate rules governing practice and procedure in civil and criminal cases in all courts,'' and that any such rule ''may be revised by the General Assembly.'' The legislature has recognized that Rules of Evidence are ''rules governing practice and procedure'' in a 1982 amendment to 12 V. S.A. § 1.